You may have seen this space ship looking apparatus at your local gym. If you are looking for a great way to change up your workouts grab yourself a Bosu Ball, and go crazy. 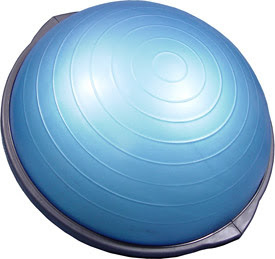 The basic idea behind the Bosu is; it forces you to use your core muscles in addition to whatever muscles you're working. 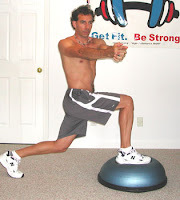 Ie: When doing squats on top of the Bosu you have to engage your abs in order to keep your balance. It is amazing how you can increase your difficulty level by making the ground beneath you a little shaky. You'll intensify your workout, work your core, improve your balance, and fight boredom. All great things! Trust me. The Bosu is awesome. Megs, thanks for the reminder. I need to do more on the bosu! !